lifting nut (load nut) for Nussbaum Lift Type ATL, SEL (1 spindle) or 4 post lift / Platforms - Automotive stage. 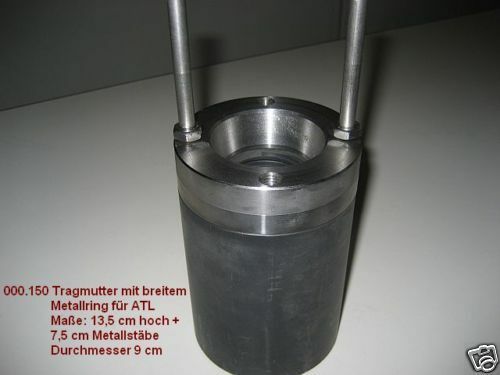 You are purchasing a spindle nut (lifting nut) for Nussbaum Lifts / lifting platform. The exact amount you can enter below the price under number. The load nut also fits for Type ATL, SEL (lifts with one spindle) to 5 tons lifting capacity. Dimensions: trapezoidal thread 43mm (Spindle diameter) x 7mm (thread lead), height 140 mm + 75 mm metal rod height, diameter 92 mm.